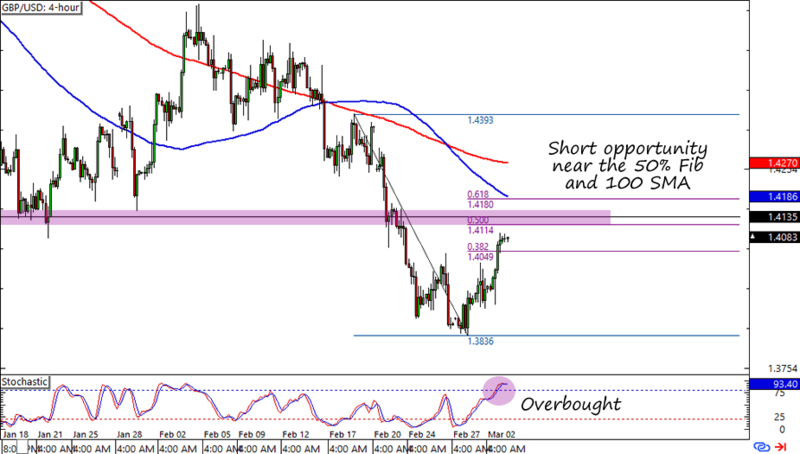 Forex Trade Setup: Another GBP/USD Retracement! Spotted another opportunity to short GBP/USD! Do you think Cable’s downtrend is still intact? Here’s a chart of the forex trade setup that I’m looking at! I might have gained 0.14% from my last GBP/USD short trade, but I think that there’s still room to gain a couple more pips from the pair! Right now I’m looking at Cable’s 4-hour chart, which is showing a possible short opportunity around the 1.4100 area. See, it lines up with the 50% Fib as well as a previous area of interest for the pair. And all just below the 100 SMA, too! The cherry on top of this potentially sweet sundae is an overbought signal from Stochastic. On the fundamental side I’m still favoring the dollar over the pound. Economic reports from the U.S. have been rockin’ it lately, and are fueling expectations of another Fed rate hike in the foreseeable future. I’m not trusting the recent risk rallies either, as the risk-aversion-triggering stories from a few weeks ago (oil supply glut, China’s weak economy, dovish central banks) haven’t changed in the big picture. I’m planning to enter a 0.25% position at the 50% Fib area with my stops above the 200 SMA with plans to add another 0.25% below the previous lows. I’m not placing any orders yet though. I think I’ll wait for the U.K.’s services PMI or at least a new catalyst to see if the pound bulls will extend their moves today. What do you think? Does the pound have more room to fall against the dollar, or have we seen the last of the pound’s weakness?